The first thing I noticed when she got onto the streetcar was her leg. It looked to be tattooed with an ornate flowering vine climbing from the top of her sneaker to somewhere beyond the bottom of her shorts. It was truly beautiful and unlike any tattoo I’d seen. As she came closer, walking the length of the streetcar, I noticed the knee. It was a mechanical joint. For a fraction of a second I thought it was a steampunk fashion statement. Then I realized that her whole leg had an un-flesh-like sheen and was whiter than her other leg. It was a prosthetic. When I was a kid, losing a limb was not a topic for conversation. A man in my hometown had an artificial hand; he always wore a grey glove, whether due to shame or social stigma, it’s hard to say. I remember when I was maybe three, curiously pointing out a blind man on the street to my mother; she told me not to be rude. Disability—different ability—naturally evokes children’s curiosity. 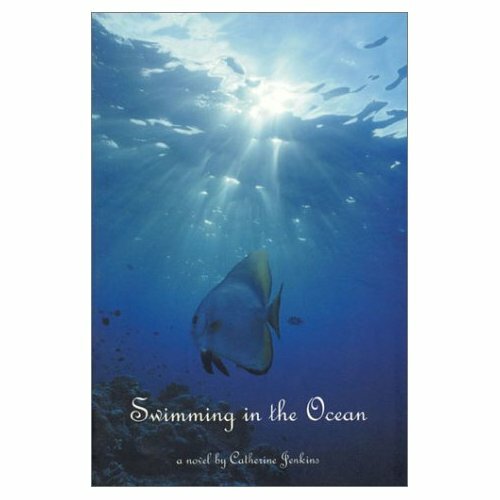 The other is more othered than we are used to, maybe more than we are comfortable with, and that evokes curiosity. What’s wrong with asking, with being curious about another body’s circumstance and how it functions in the world we co-inhabit? 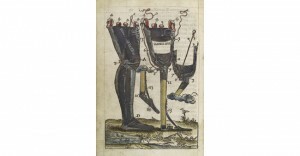 London’s Wellcome Collection displays the design for Ambroise Paré’s 16th-century artificial leg. More recent additions to the collection include a pair of girl’s artificial legs from 1966, complete with little red shoes, and the i-limb, a high-tech artificial hand. People have been dreaming of ways to replace lost body parts for centuries, but these often clumsy replacements were hidden and as close to the originals as possible. Most contemporary artificial limbs seem to sink into the “uncanny valley”; they try, and fail, to look normal. But it would seem that a new generation, adept at high-tech and with an encouraging creative flair, has new ideas about designing prosthetics. 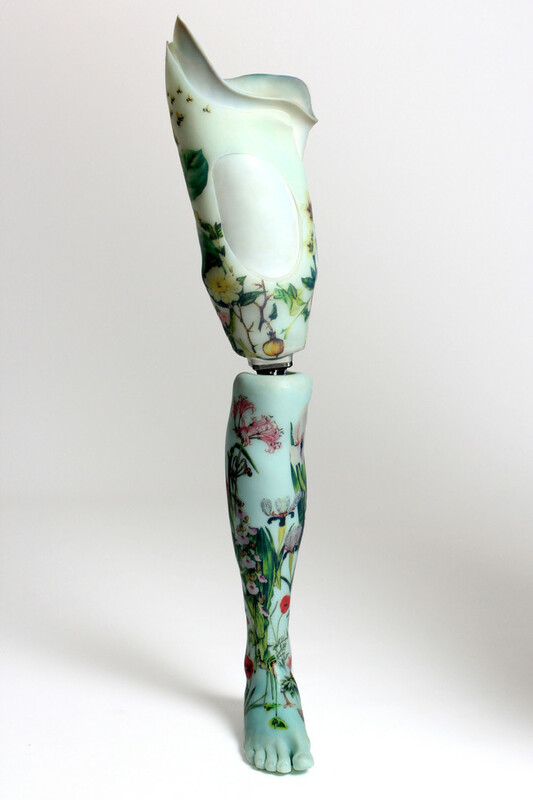 I found the young woman’s Floral Leg on the Alternative Limb Project website. This British company creates limbs that “stand out as a unique piece of art, reflecting the wearer’s imagination, personality and interests.” The owner, Sophie de Oliveira Barata, started her career in television and film special effects prosthetics, and has transferred her skills into the real world. While she continues to make realistic-looking artificial limbs, she has also designed a variety of “alternative” limbs, including legs fitted with stereos or crystals, a gadget arm (that looks very steampunk), and arms with snakes or feathers or carved wood. 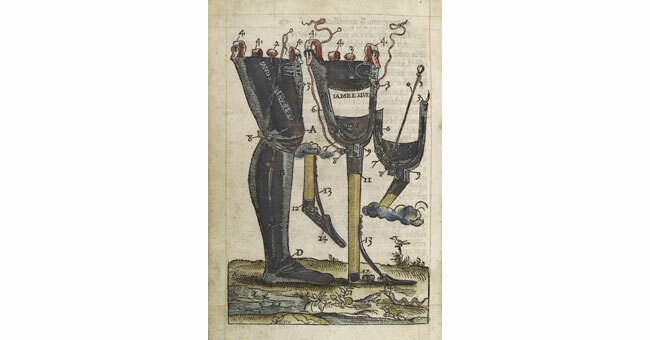 These are artificial limbs that, while optimally functional, very consciously do not look like the limbs they’ve replaced, but rather make a creative statement. These are replacement limbs meant to be noticed, meant to evoke conversation. I don’t know what happened to the young woman on the streetcar, but I do know that it takes a lot of violent force to rend a limb from a body, or to damage it to a degree requiring amputation. Bike accident? IED? July has been a cruel month, with wars in the Ukraine, the Gaza Strip, Syria, Nigeria… Hundreds, or thousands, of innocent people have been killed or maimed, either as “collateral damage” or with quiet intent. Planes have been shot down. Houses and schools attacked. Unprecedented numbers of people are on the move with nowhere safe to go. A lot of violence. In my mind, these events are somehow solidified into this one image of a young woman wearing an artificial limb designed to attract attention and evoke conversation. When we got off at Bathurst Station, I wanted to shout after her, “I love your leg! It’s beautiful!” but I couldn’t find my voice and she disappeared onto a waiting bus, with dozens of people looking after her. This entry was posted in journal, Social Commentary and tagged artificial limb, tatoo, war on July 28, 2014 by admincj.